You know I'm all about spreading the LOVE on this blog. I want to introduce you guys to Miss Natalie Jones, the Fabulous Woman behind ChocklatTea. The first time I met Natalie was actually at one of her brother's event's here locally in Tampa. Upon entering the event, she already knew who I was and she was very nice and friendly. We also, attend the same church where Natalie's dad is the Pastor. To add to that, Natalie is also FAMU Alumni like myself! Its so crazy how many FAMUANS I have met post college here in Tampa. While in college, Natalie was a member of one of FAMU's Premier Modeling Troupes - Epicurean. I remember seeing her strut her stuff in the Fashion Shows, but had no idea until recently that she was the girl I used to see on stage in the shows. CRAZY! Well enough with my rambling, I want you Dolls to get to know Natalie, what she's about, and what she has to offer through her lovely jewelry line ChoklatTea. I'm sure that you will gain some enjoyment as well as inspiration from this Interview with Natalie. Who is Natalie Jones? Wow, this is a tall question, LOL! Natalie Jones is a genuine, loving, talented, educated uber creative being. I have been involved in everything from sports, theatre, & modeling to dance, leadership & design. I take risks, love hard, accept challenges & live a unique life. I’m a singer, songwriter, designer, stylist, model, sister, godmother, aunt, daughter, friend, natural hair rocking fashion induced supreme music aficionado! I see in colors, patterns, melodies & textures...everyone and everything has their own unique mix. So, when did you fall in LOVE with accessories? Great question. My love for accessories evolved with my growth. I was a girly girl as a child then morphed into a tomboy through sports and now I’m just well rounded. One day I’ll be all dolled up and the next relaxing in my sneaks. So I’ve rocked accessories accordingly...from my MASSIVE charm necklace as a young girl to sports inspired baubles during my track years to now all things different, colorful & one of a kind. I’m a statement piece type of woman. Seeing as though you’re an accessory LOVER, what are your Top 5 FAVORITE pieces in your personal collection? Only 5? LOL...let’s see. In no particular order...1) Even though I no longer have it, my old school charm necklace b/c I believe that collection started all this accessory madness in my life! 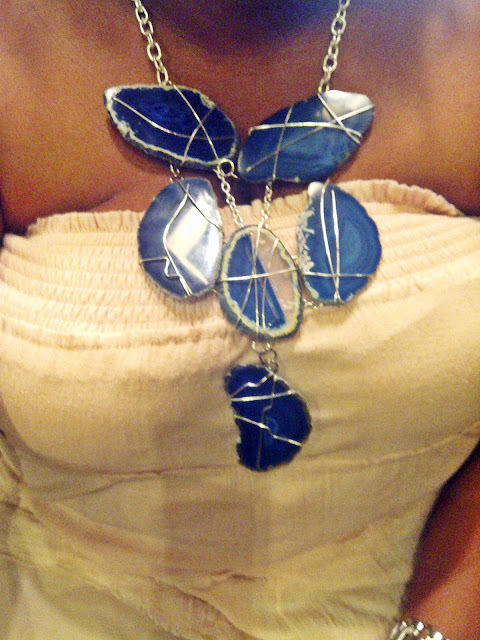 2) Blue Agate MultiStone Neckplate. Its from my line and the first one I made. I was very proud of the outcome so it has become a staple for me. 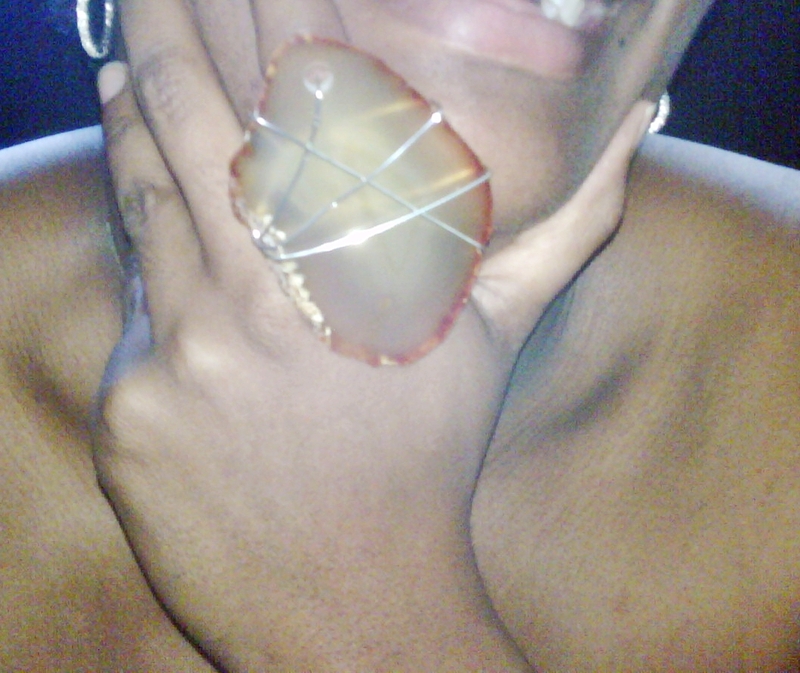 3) Camel Colored Agate Ring, also from my line. Topaz is my birthstone but I never found a standout piece I liked to represent my birthstone ring so I made one. This is the ring I normally wear daily. 4) Vintage Collection...there are multiple pieces involved here. I got this bright idea to go to all the senior members of my church one day and ask if they had any vintage pieces I could have. I figured “you have not because you ask not,” so I asked and received. I really love them...very grateful for the artistry and history of these beauties. I will definitely pass these on to my daughter(s) some day...as soon as I have them. :-) 5) Vintage Clutch...its an oversized clutch I got from my Mom but I believe she got it from my Grandma. Its this buttery caramel leather with red and green accents. Everytime I carry it someone tries to steal it. For the record that will NEVER happen! Tell me about your Etsy Shop ChoklatTea. What made you decide to launch it? 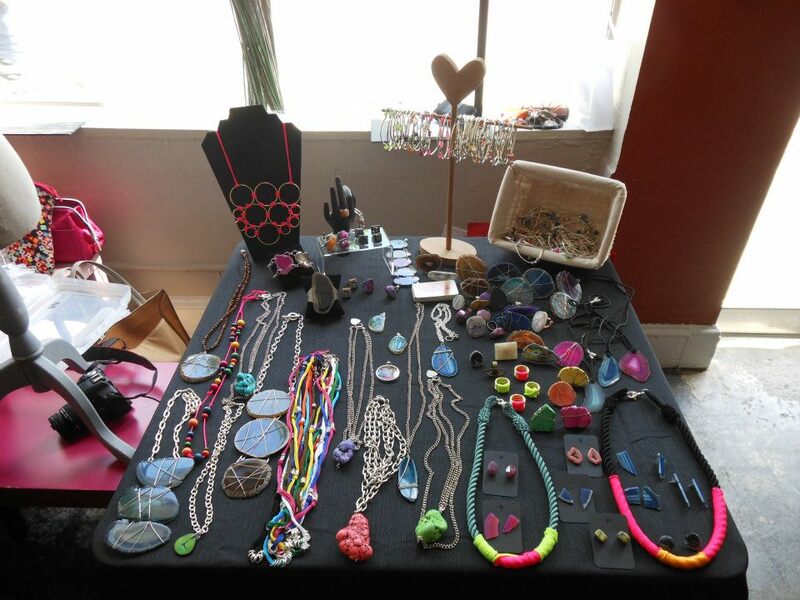 My shop is filled with rings, bracelets, necklaces, earrings, cuff links and more. I am driven by color so that comes out in my work. I also have some designs for men but they sell out so quickly so I’m currently working on some more male additions. There is actually a story behind my Etsy launch. An artist named Liv Warfield, who is amazing was on Twitter one night looking for suggestions on designers to get into. I had some designs made but, at the time, no visual presence anywhere so I gave her a few names of others but I also included mine. I then rushed over to Etsy and created an account after she inquired if I had a website. My response to her was www.ChoklatTea.etsy.com. That started it. I ran the shop from my Blackberry at first. That was hilarious. I always wanted a website but having gone back to school full time, it was not in the budget at the moment. So, Etsy provided me the opportunity to not only create a visual presence for my brand but to do it in an economical way. How would you describe your brand? How did you create it and what does it mean to you? ChoklatTea represents all things creative...if I think it I will find a way to incorporate it into my line. Its classy yet edgy with just the right mount of funk and color. I consider all of my work statement pieces however every piece is not this massive structure of adornment. Most people hear the word statement and immediately think GINORMOUS but you can wear a petite piece while still making a statement. It can be a statement of color, a statement of obscure shape or texture. I like my jewelry to invoke conversation. I design it in love so that it brings happiness/joy to the wearer. I am inspired by everyone and everything around me. It starts with a visually mental idea and I sit and just zone out and create. I normally keep all my prototypes and then build off of them for my clients. I am a walking billboard, people see it on me and inquire thereafter. My brand means everything to me, its who I am. ChoklatTea is the creative being within me manifested to visual/physical interpretation. Tell us about your current collection? Currently, my collection is infused with rope, cord & neon. I got inspired after recreating a DIY project. Unfortunately, a friend bought my prototype so I have to make another for myself but the neon detail sent my mind on a journey. The Rope Collection is the result of that. These are up-cycled creations, with use of rope, construction line cord and silk thread. The end product has a nautical/tribal/elegance vibe to it. It’s perfect for summer but capable of holding its on once fall and winter come around. The best part...it’s light weight which is ideal for these hotter months. No one likes an accessory that weighs you down. Oh no! Are the creations your own personal design? Yes, I design everything. The DIY project that inspired the Rope Collection was not mine. However, I loved the fact that once you got the hang of the original piece you could structure it your own way so it was no longer a copy. Who is Choklat Tea’s audience? My audience is anyone who loves unique, one of a kind designs. Its that woman or man that desires to make a statement, whether large or small. Its a line that speaks to the personal style of the individual so my clients tend to be those who hold their own fashionably. My audience ranges from strict conservatives to the insanely open-minded out of the box individual. There is no age restriction either. What is uniquely different about ChoklatTea compared to other accessory lines? No two pieces are alike. Even if it seems similar no two pieces will be the same. I take time to properly craft every piece so the wearability is tried and true. I hate when I buy a new piece then wear it a few times and it starts falling apart or losing that spark that prompted me to initially purchase it. So I work hard to ensure my clientele is happy with their selection. Customization is big with ChoklatTea. I would say 60% of my orders never make it to the Etsy shop b/c they are customized from, color, size, fit, style, etc. 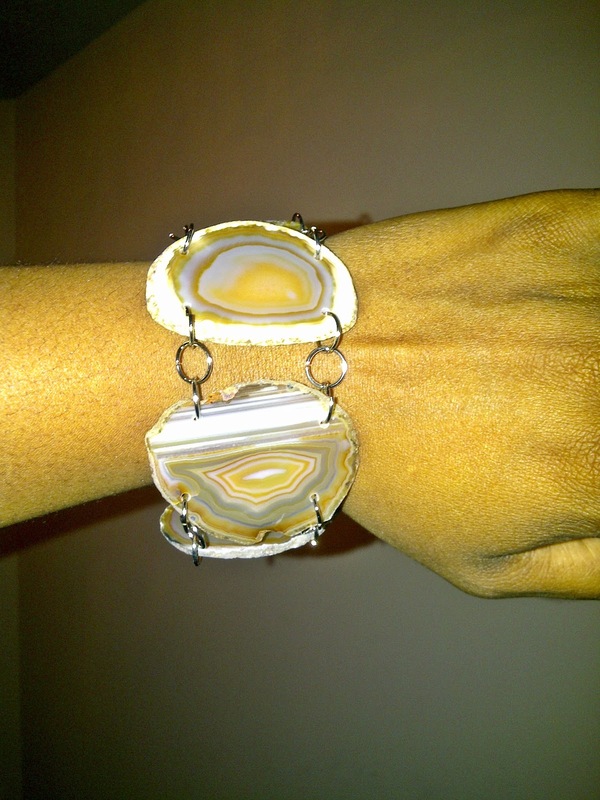 I know of some amazing accessory lines out there and I support them. ChoklatTea is unique because Natalie Jones is. What is within me comes out through my line and I know and believe that no one can do what I do the way in which I do it & that alone is a standout characteristic. What are the price ranges for your pieces? $10 - $150, currently on Etsy. 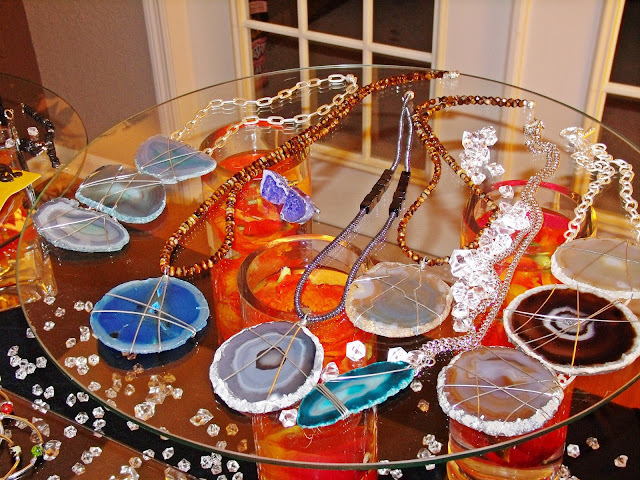 Customized pieces: $20 & up, depends on the piece. How do you plan to expand ChoklatTea’s product offering? I work a lot with agate and other stones. Going forth I plan to incorporate wood, sand, paint, chain and more! I plan to expand the men’s line with more offerings as well as eventually incorporating elaborate metalwork, and whatever else is birthed through me. Where do you get inspiration for your pieces? Music, landscape, fashion, relationships, various textures...pretty much any and everything around me. Sometimes it comes in such random forms, and other times more precise. As you know, What’s More Important Than Fashion is all about being Fashionable and Financially Aware. Tell me how does Natalie Jones and ChoklatTea embody that motto. I used to be an impulse shopper. If I liked it I bought it, if the shoe fit I would buy it in two colors, etc. Once I started designing, my eye for the impulse changed and I started making my own. Now I shop more economically. If I LOVE it I buy it, if I like it I leave and if its still there when I come back then I weigh my options and either take it or leave it. I’m not a big “trendy” shopper b/c trends fade so instead I shop my personal style which has provided me with some timeless staples. Trendy pieces for me tend to be an accessory or two, or I will just save money and recreate it for myself. For example, I am tall, so I make my own maxi dresses b/c those in-store are too short for me & I refuse to pay more $$$ for my height to be accommodated. With ChoklatTea, I keep the client in mind making sure not to price-gorge. I believe you can be uberly fashionable without having to take out a loan or refinance your life in order to do it. Wasn't that a fabulous and inspiring interview! Being a Blogger, I come across so many DIY and Entrepreneurial Divas doing their thing. Natalie is definitely making her mark with ChoklatTea! She makes it seem so easy, right? Be sure to click the links above for more ChoklatTea! I'm in LOVE with her line and I am so happy to see a line that includes items for both men and women and she even provide custom pieces! Dolls, make sure you show Natalie and ChoklatTea some LOVE. 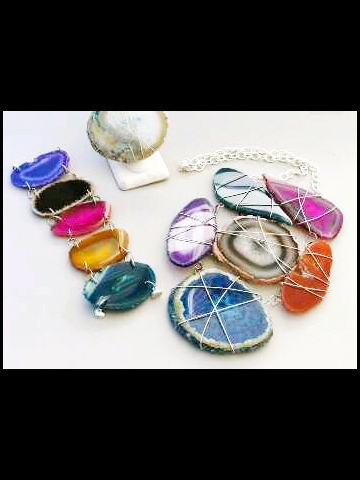 I love some DIY and these are some nice pieces, you go girl. I know you do Keisha! You're next!!!! LOL!!!! Waiting on you! I actually had th pleasure if meeting her when I went on the Chic Boutique Chic she had a booth setup in Bombay Gal & she had some really cool and unique pieces. WOW G! What a great feature and a talented, savvy designer! I'm def going to check out her designs! Lawd knows I love me some ChoklatTea, I do!! I always get compliments everytime I wear one of her pieces and she is an amazing friend, designer, woman, and all things that make her who she is. Congrats on this awesome feature!! Wow, she's very talented & creative.. I love her designs would definitely check her out on etsy, thanks for the lovely feature! Wow she has some really nice pieces! You did a great job featuring her!